I have a feeling that 2016 will be one of my best ever. With the New Year I always have a feeling of hope. Hope that I will get my studio cleaned and organized better; hope that I will complete more projects; and hope for people to have a better life. 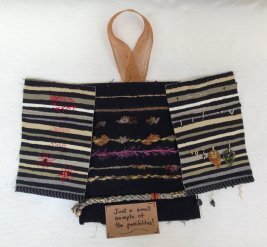 Let's tackle the elephant in the room first - my uncompleted projects. We all have them and believe me I hear it all the time, "I cannot start a new project without finishing the ones I have!" This is pretty unrealistic for me and probably most of us. It seems to me it is punishing me more than encouraging me. This is what I did one year and it worked! I first found and sorted my UFO's. I made a group of ones I really needed to finish (high priority). I then selected ones I really loved, but they could wait a bit longer. Finally, I have the ones that I DON'T LIKE anymore. We all have ugly projects, but I simply cannot throw them out. They can stay in my studio for years giving me guilt trips every time I look at them. Ladies, GIVE THEM AWAY! There are many charity groups that could use them; the Ugly Bin at the BRQG would take them, or you could even gift them. Once I organized them, I made a REALISTIC goal. Mine was, "I will not start a new project until I complete three." I then set about the task to complete them. I purchased supplies if I needed, and actually worked on it. Before I knew it one was finished. I felt wonderful and went on to the next. Soon, I had three done. I must admit, one only had the binding to complete, but I did it and it counted. I rewarded myself with a glass of wine and a class/project that I had always wanted to do, but guilt never allowed me too. I challenge all of you who have too many UFO's to try this method. Bring those projects in and share them with us. We love Show & Tell! While you are here, check out our new projects and events we are planning and make sure to save the dates. JoAnn Gibbons will be beginning her Silk Ribbon Flower class on Monday, January 11th. These handmade flowers are sure to enchant you and will be the perfect addition to your bouquet of embroidery techniques. We have the ribbon, needles, and Seta Silk Paints that you will need. 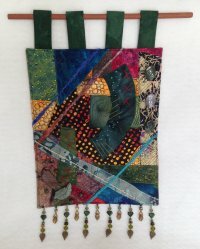 On January 15th, nationally published quilt artist, Heidi Zielinski, will begin her Embellishing Wall Quilts series. These workshops are independent of each other and will enable you to apply the perfect embellishment for your piece. Remember, it is the jewelry that completes the outfit! We are lucky to have such a talented artist locally, so let's take advantage of it. 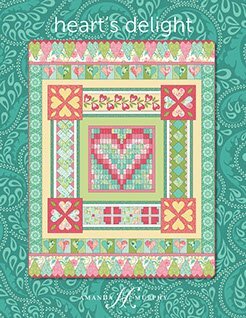 Our newest Block-of-the-Month, Heart's Delight, by Amanda Murphy will begin on January 23rd. This is a darling project that continues to improve our techniques. I have some great tips and tricks to share with you. We only have two kits left; however, you do not need a kit. The quilt would work well with that scrappy look. Marilyn's newest "bag" is not really a bag at all; it is a Catch All Caddy! This is so cool to organize and keep your tools and supplies handy. It could work equally as well for baby items, cosmetics, gardening, or fly tying tools. Class is on January 28th, so sign up today. During the week of January 25th to January 30th we are having a “Take Back Their Life” EVENT to support our local SAFE Women’s Shelter. Please bring us donations of paper products (toilet paper, Kleenex, etc. ), feminine hygiene products, household cleaning supplies, and self-care products (toothpaste, shampoo, etc.) to help these women Take Back Their Life. Wow, we are going to be 6 years old this month! So please, join us on January 29th and 30th for Patchwork Quilt’s Birthday Celebration. To celebrate our big day, everything in our shop will be a whopping 20% OFF. We will also have physical therapist Chris Phipps give us tips on how to be ergonomically correct when we are at our machines sewing. Patches will also have Pillow Talk. I will be conducting FREE classes (demonstrations) on Pillow Making (18” square). 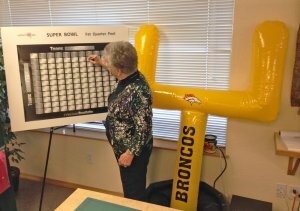 Ruth Ann will also be giving demonstrations on using the Stripology Ruler. Details of our celebration event will come your way soon. Our 3rd Annual Super Bowl Fat Quarter Pool will start January 25th. This is a super popular event! Additional information is forthcoming. Check out the EVENTS section of our website for details on all our events. Sorry for the long newsletter. We didn’t want to inundate you with multiple newsletters during the holidays so we combined lots of information into this one. We’ll get back on track next week.